Hey guys! 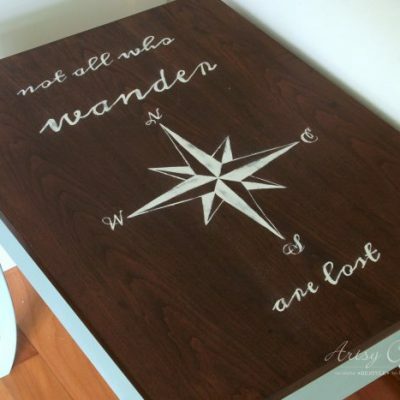 It’s themed furniture day and I have an OBX Latitude and Longitude table makeover to share with you all. 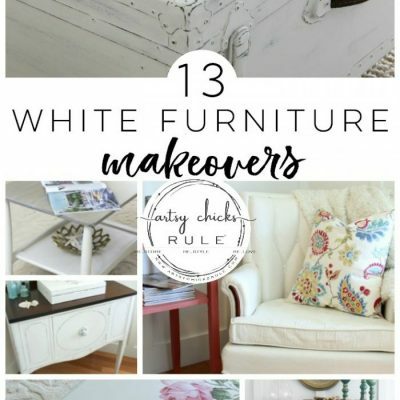 Myself, along with some of my blogger friends, like to bring you a themed furniture makeover every month. 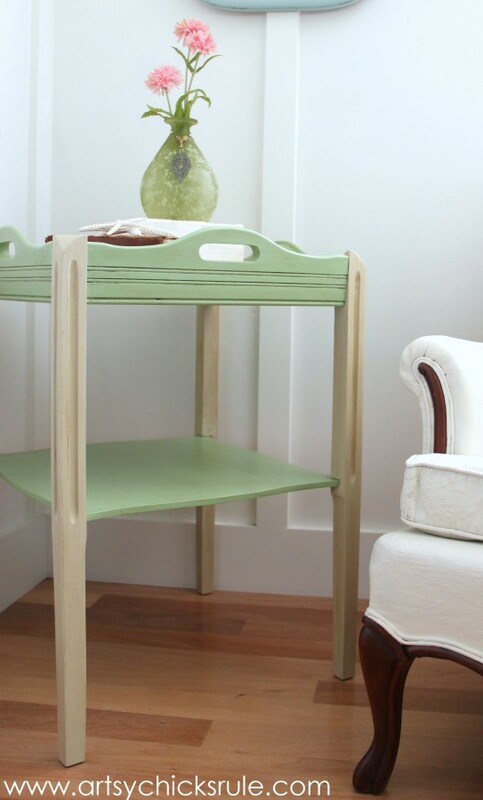 Hmm, not really too much of a challenge….except that it’s a furniture makeover. I’ve done plenty of signs with numbers. But I was a bit stumped as to what I would do for a furniture makeover…with numbers. I mean numbers, really? Should be easy, right? Put some on, be done (and lots of cute ones out there like just that!) but I wanted to do something a little more. So in trying to find my ‘number creativity’ I thought about how much I love living by the ocean and love all things coastal, etc. It hit me then. 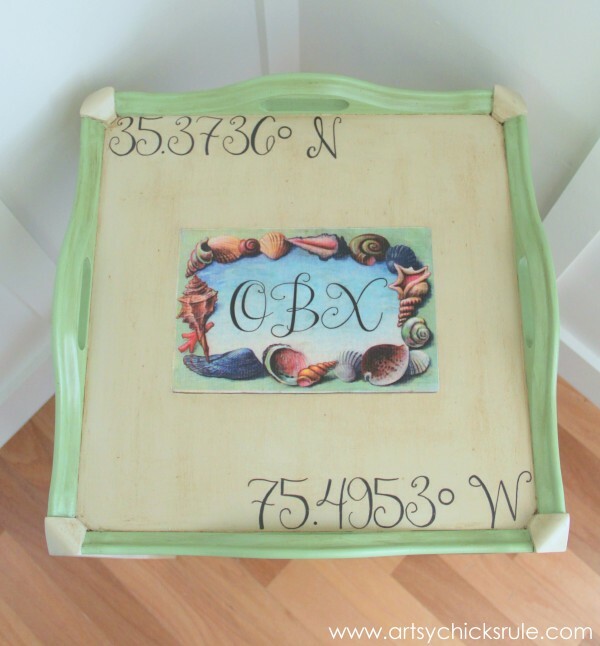 What better way to incorporate my love of the ocean AND use numbers on a piece of furniture? Okay, there are probably better ways but this is what I came up with…. 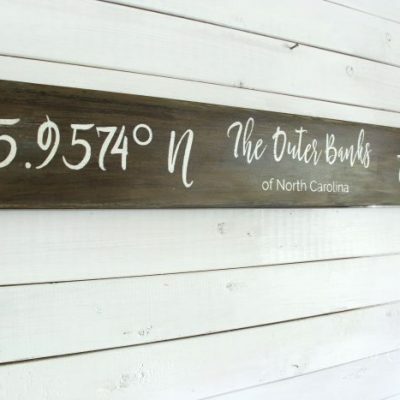 …Latitude and Longitude of one of my favorite places—–> The Outer Banks of NC. Which happens to be less than 2 hours South of where I live. I decided this little table would be the perfect thing to put those numbers onto. I actually went “outside my box” a little on this one color-wise too. I love green, I don’t know why I don’t use it more often. I’ve been trying to incorporate it into my decor a little bit more lately. It’s such a happy color! 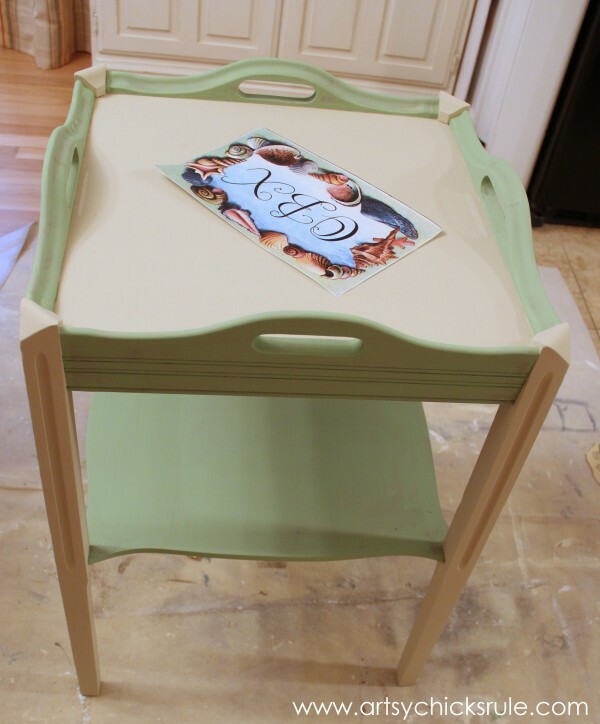 Here it is after I painted with Antibes Green Chalk Paint and Country Grey Chalk Paint. Love these 2 colors together. I did 2 coats of each color. The green in this photo is just one coat. I applied one more. I added the OBX to the middle of the “postcard” and printed it out. 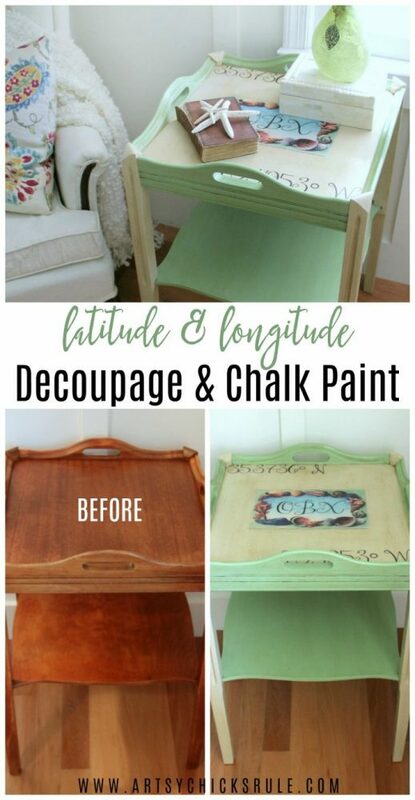 You can download the numerical graphics here…..
After the paint was dry I used Mod Podge to decoupage the vintage postcard graphic to the top of the table. Then created my Latitude and Longitude numbers and printed them out to transfer. There are some extra words on there that I ended up not using. Sometimes less really is more. In this case I think so anyway. It was just too busy and I wanted to keep it more simplistic. Okay….so all painted in and finished. How I got to that…I hand painted in the numbers with Graphite Chalk Paint. 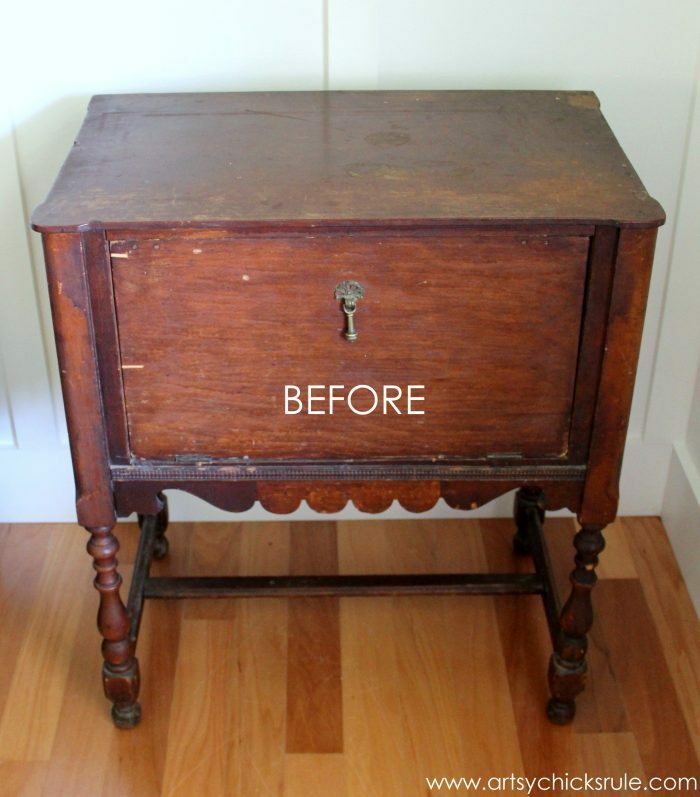 Then I chose to use Varathane (because it’s just rock solid) like I did on my kitchen cabinet makeover. I wanted to make sure the decoupaged paper had a very good sealant. I used 2 coats. I love the effect it gives. I was a little unsure of this one as I was doing it but I think it turned out okay. You might have noticed (or not) that I didn’t do any “distressing” on this piece. I decided instead to let the dark wax do the work. These themed makeovers really make you put your creativity to the test sometimes. And I really, really think I need more green in my life. 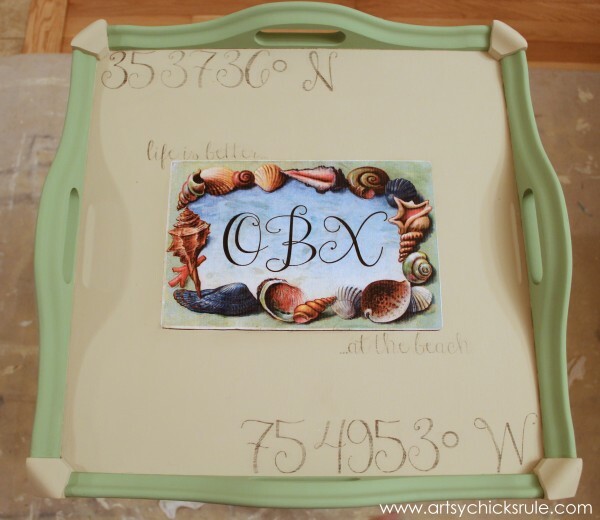 PIN this OBX Latitude & Longitude Table Makeover for later here…. 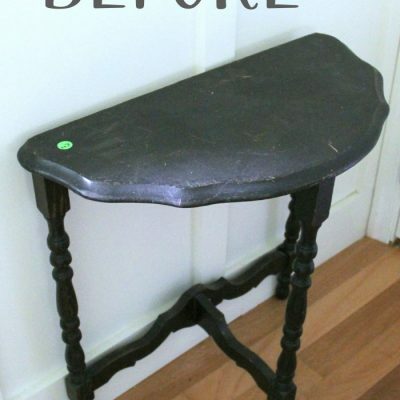 Be sure to check back later this week to see how I transformed this one! It looks great, Nancy! I love the toned down green and the graphics. And yes , life is better at the beach! 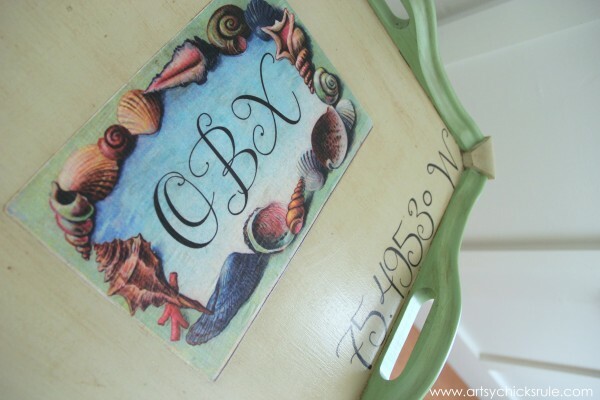 I love that you incorporated one of my favorite place, the OBX, into this makeover. I also love the paint combination that you used. 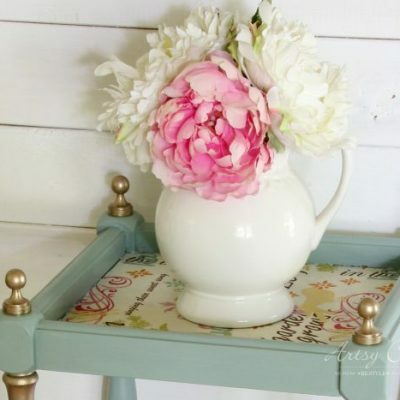 These tours are so much fun to see how each blogger interprets the theme of the month! Thanks Paula! I agree…I’m really loving this one!! This came out awesome Nancy! I love that you used Longitude and Latitude numbers, brilliant! I am thrilled to have found your blog! For the second time this week, I am thoroughly impressed. Not only your imagination in action, but OBX is our annual Easter destination. Great job here and thank you for sharing! Oh yay! Thanks so much! :) How fun…we love the OBX! Thanks Therese! :) Green is great! I’m loving a tiny little pop of green here and there lately! I’m really enjoying everyone’s projects a lot this time!!! So much creativity! Loving it!! 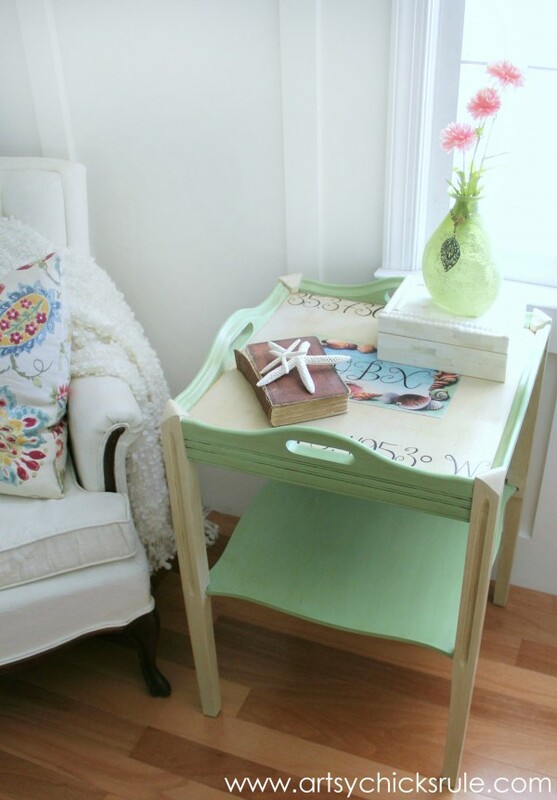 Nancy your table is gorgeous – I love how you toned down the green into a much softer shade. The postcard is so pretty and once you added the dark wax over the poly it took on even more character. 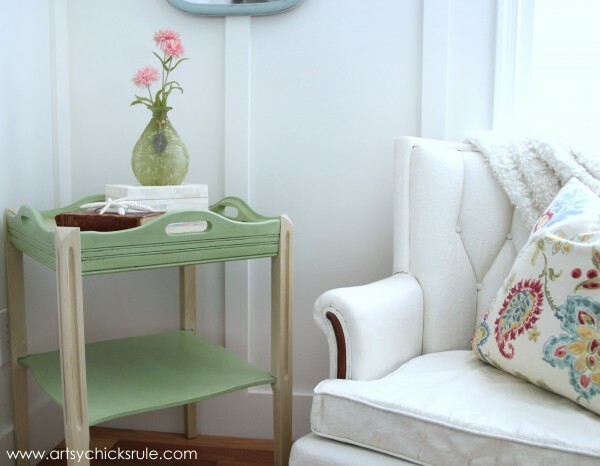 The colors look so pretty with the cushion on your chair and of course you staged the table beautifully. Very nice! I have been working so hard on trying to get better photos…and do better staging lately. I so appreciate that more than you know!!! I’m not much for green but these colors worked well for this table. What’s not to love in the OBX! Love the OBX graphic and coastal green! The dark wax really enhanced it! Your table looks wonderful next to your chair! Love the OBX too! Thanks so much! I know, isn’t it crazy how much that dark wax changes the look? It somehow takes that “flat” look away and gives it some depth. We live right here by the water but the OBX is so great! Wish I could get there more often! Beautiful job Nancy! You did a great job on the graphics and the Latitude and Longitude idea was brilliant! Love everything you do as usual!!!! …… You mentioned Varathane. 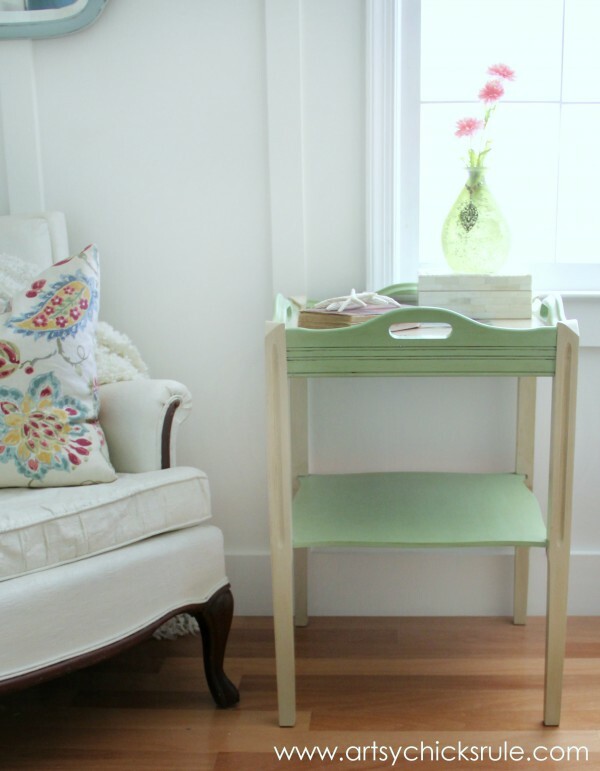 When I did my side table, I looked for Varathane. But my local Home Depot didn’t carry it. The carried another brand of spar urethane, but that was for outdoor????. This all confused me, lol, so I waxed it! So could you let me know with Varathane you used? (I got so confused with spar urethane, poly, etc). Could you help out a sista? lol…. 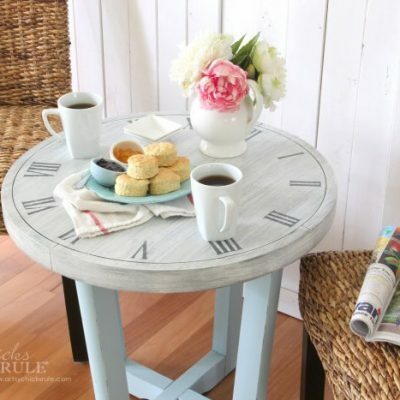 I want to show you my side table… Im pretty proud of it! I just don’t have a good before but I’ll send you what I have! And I;m working on my chair right now – Painting upholstery in Paris Grey! 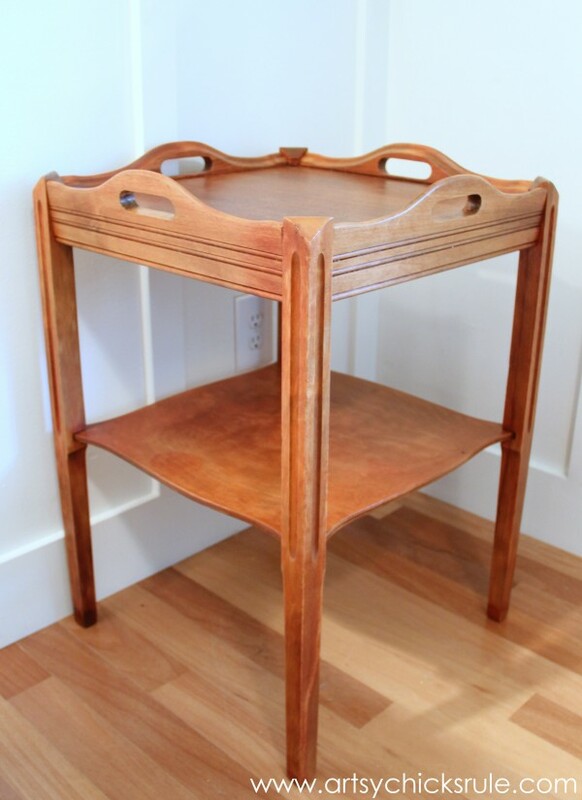 I think I linked it in this post actually…anyway, that is the same exact one I used on this little table. Wax is good too! If I didn’t have the decoupage area I would have just waxed the whole thing and skipped the Varathane. Try Lowes if Home Depot didn’t have it. I got it from one or the other..don’t remember which now. Please send pics…would love to see! :) The chair and the table both! Thank you Andi! Green is fun…I don’t know why I don’t use it more often. Really cute Nancy! I love the green. I didn’t know what OBX stood for. You can tell I’ve never been there!! Would love to though. Oh yes, you should visit some day! It’s a great place. Thanks Christy!! Oh my, you need to make a visit there! I’ve been itching to use that green some where. You’re color mixing is amazing – really soft & pretty. Blend in well with your blues & continue your beachy/water look. The outdoor table end you did previously has me thinking about sprucing up our porch & making it brighter. Always inspiring to see your creations. Love it! But then again, I love everything you paint! 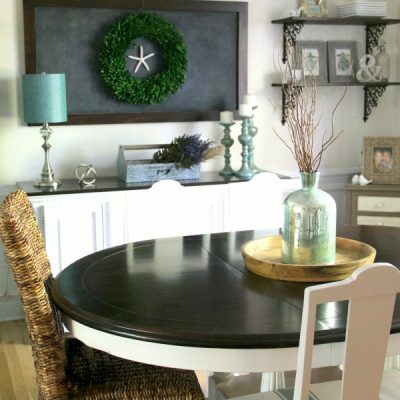 Your green came out just right for your table and decor too. Hugs! Love the table, Nancy! Especially the customized color of green you came up with! Two colors I would never have thought of mixing. Thanks so much Karen! :) The green is really fun! 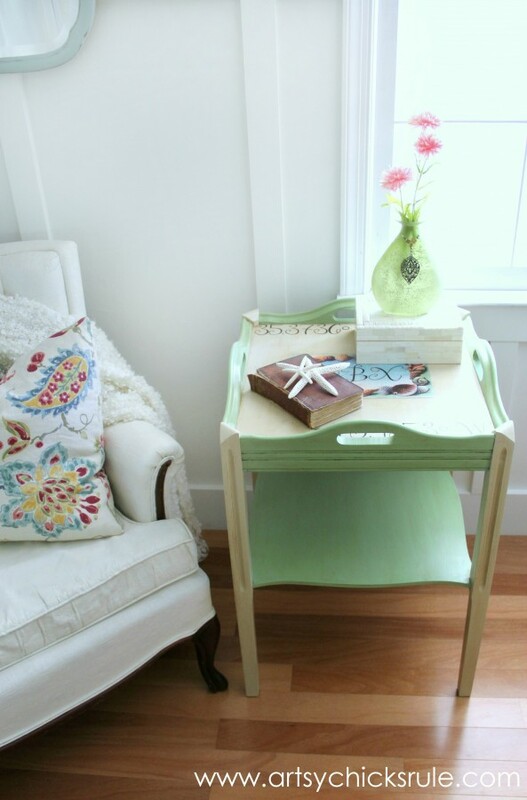 Absolutely love that green, so soft, that table looks so pretty with the green on it. 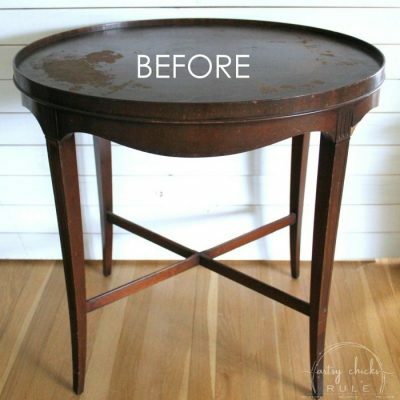 Like how you made legs different but very good combo, make table look awesome. I also like to combine colors to get what I want. Only thing is then to be able to duplicate it later on. Uh, maybe. Just keep mixing til it looks right, right? so FUN!!! I love it!! I love the colors! What a cute little table. Hi there – while searching The Graphics Fairy for nautical graphics, I came across your beautiful seaside table transformation. It’s absolutely beautiful…and I agree life is better at the beach. I’m in the process of revamping my vintage sling chairs and want to add a graphic transfer to the pillows. It will be on my blog soon! Thank you! :) I just love The Graphics Fairy (and Karen! )!